My recording setup comprises of a Boss Micro-BR for quick and simple recordings and a 2008 MacBook Pro running Cubase 5 and fed by an Edirol FA-66. Depending on the need (and the time of day 😉 ), I record my guitar(s) direct to the recorder using a Marshall JMP-1 Preamp or I use a 1974 Silverface Fender Champ miked by a good old Shure SM-57. I also occasionally record direct using a first generation Line 6 Pod. My gear as of January 2017 (in a totally random order). I have somehow culled my pedal hoard but there is still a lot left. It’s great to a Rat on the pedal boards again. Nice simple set-up. It this the board you run into your Silverface Champ? Hi, yes I run this board into my Fender champ or a Marshall JMP-1 preamp when I record direct. I also have an old VOX AC-30 but it needs some maintenance (super amp though). If you have any suggestions towards my pedalboard, feel free! Always looking to improve and expand. I haven’t heard of the T-Pedals HiFuzz, I will check it out. 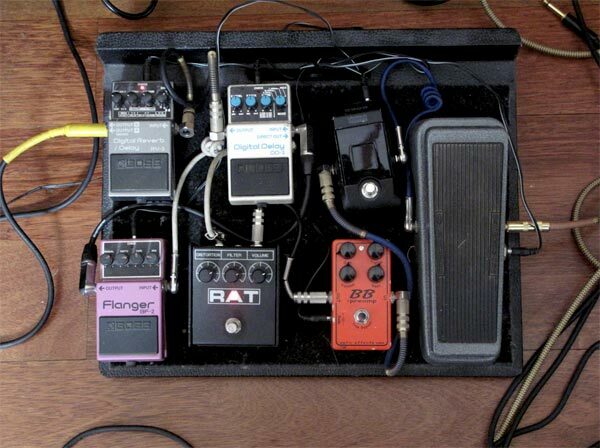 I like your pedalboard, very original, what kind of tone are you after? Hey, what do you think of the RAT 2 distortion pedal? HI, it’s one of the greatest distortion pedals but beware, the older ones are actually better, read my post about the RAT 2. I have a Boss BF-2 MIJ silver screw I have owned since 1979-80 (i think?). I have problems incorporating it into an FX chain. I have just picked things up again after 28 years and would appreciate any insight into using such an old buffered pedal with modern ones. I have tried it first in the chain for its buffer, as suggested by others re: true bypass vs buffer arguement (eg.Pete Cornish) and in a standard modulator position. In bypass I get noise with a “low level” flange fx and it seems to muddy the whole signal where every I put it, and that includes on its own. Its in near mint condition and not used for last 28 years, I don’t believe there a fault with it though I guess it might be that. I am learning still and hope I have explained well enough. Barring a fault what thoughts could you share on its use? I don’t yet have a separate bypass switcher which is in consideration but for priorities and financial reasons not got there yet. Also what do you think of modding vs pristine vintage in this particular case? Hi, as a matter of interest, what type of guitar and amp do you use? Also, do you power the BF-2 with batteries or a power supply? This could have an influence. It could be a fault of course although some of those old Boss pedals had bypass “bleed” issues (The Boss SD-1 is notorious for this, even later models). My BF-2 is nearly as old as yours (it’s MIJ so not older than 1984) and this did not shock me. The way I see things about modded vs pristine vintage is that modern modded pedals usually offer a cleaner signal and that is why guitarists often choose them (the Analogman modded DS-1 is a lot quieter than the original Boss for instance). That said, a lot of great 60s/70s guitarists managed to work around these sound quality issues which, often times, cannot be heard in a band situation. What I mean is, if a pedal seemed to muddy the signal, they might have cranked up the treble on their amp or used an equalizer pedal to compensate. But if the sound quality is too much of an issue, you are better off going the moderne boutique/modded route. As to the buffer vs bypass issue, I tend to prefer a buffer at the beginning of my signal chain, I find the tone loses less of its “sparkle”. Loving your pedal collection! Will be looking into some of those pedals for myself. Thanks for your info. Really helpful. i don’t know if this is the right page, anyway i’m asking: i own a Line6 Pod XT and i’d like to get out of it a “big L.A. solo sound” (for example see from 2′:35″ of http://youtu.be/5gU5Vg2JokU); which type of chorus and delay would you use? how would you set chorus/delay parameters? How do you like the Variax? I have a JTV-59 and I absolutely love it for its versatility, but I’m not as tone “autistic” as guys like you. Greg Howe has said some of the tones he gets from a Variax are dead on, but I’m curious as to what others think of it. Hi, I had a Variax for a while, the first model (later renamed Variax 500). I used it almost exclusively for two years when I got it in 2003 and then I got a bit sick of it. It’s really good but the Strat tone did not sound like my good Strat if you know what I mean.